Does it seem like you're plunging your toilet at least once a week (or more)? Not fun. Here are a few of the most common causes of a toilet that just keeps clogging and how to fix them. How to fix it: Put a garbage basket next to the toilet so the next time you're tempted to flush something you shouldn't, you can just throw it in the wastebasket. The flapper is the part of your toilet that lets water flow from the tank on the back down into the toilet bowl, creating the flush. If the flapper doesn't open all the way it won't release enough water, which means you'll get a weak flush. Clogs are common in toilets with a weak flush. How to fix it: Adjust the chain that connects the flapper to the flush handle so that the flapper opens completely when you flush. All your toilet drains vent out your roof. This helps you get a good flush. If the vent becomes clogged or blocked (like from a bird nesting in it), your toilet will flush slowly. And that reduced velocity means larger "loads" don't quite get flushed completely, leading to a recurring clog problem and forcing you to become friends with your plunger. How to fix: Clear the plumbing vent. Unfortunately, this has to be done from the roof. So this job is usually best left to a professional. The trap is an S-shaped tube that separates your toilet from the drain line (and keeps nasty sewer gases from getting into your home). If something (like a toothbrush) was flushed down the toilet, it could be stuck in this trap. Then, each time you flush, more debris gets wrapped around this object, eventually leading to a clog. A plunger can solve the problem by sending all the debris down the sewer drain, but the toothbrush stays in the trap because its shape makes it difficult to get through the S-curve. How to fix: Unfortunately, to get to objects like this out of the trap, you must take the toilet off the floor and get to it from the bottom. This is a pain, so make sure you've eliminated other possible causes. If you're uncomfortable with this at all, we recommend hiring a professional since mistakes could lead to even more problems and higher costs. Caution: Make sure you replace the wax ring on the bottom of your toilet if you remove the toilet from the floor. This is the seal that keeps wastewater from leaking into your home. If you have an older low-flow toilet, it just may not have enough flushing power. When low-flow toilets first came out, they weren't great and many homeowners reported problems. Since then, manufacturers have much improved their design. But some homes still have old models. How to fix: Replace your toilet with a more modern version. If this is a problem for many of your toilets/drains, you may have a sewer line problem. Tree roots can grow into the sewer line and create a backup. Or there can be a partial clog in a sewer line that is never quite removed when you plunge. How to fix: You need a professional to clear out your sewer lines, most likely. A plumber can also do a video inspection to see if tree roots are the problem. Want someone to do the dirty work for you? 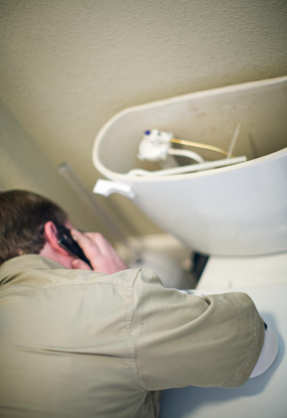 If you don't want to have to troubleshoot and fix your toilet-clogging problem, let us help. We serve the metro Atlanta area. Contact us today.